There are people who insist that Barack Obama will be reelected in 2012. Head to head polls show him leading over the various GOP presidential contenders. America, you are walking in the dark. Don’t fret over the numbers and the opinions, though. In 1980, polls showed Jimmy Carter leading the field of GOP presidential contenders despite high unemployment, high inflation and high interest rates. Had we been having this discussion then, we’d be shaking our heads just as strongly as we are now. Despite what the punditry told us and despite what the media said, a supposedly unpopular, unelectable dunce named Ronald Reagan was elected president in a landslide. Americans may look stupid on paper, but when they look in their wallets and bank accounts, they smarten up pretty quickly before walking into the voting booth. George H.W. Bush was kicked out for a way lesser economy. In fact, the mere perception that it was “the economy stupid,” lost him a second term. The truth is the economy was already on the beginnings of an upturn during the fiscal quarter when the 1992 election took place and went up ever since. Bill Clinton had not even been a glimmer in the eyes of the American people when the business cycle and mechanism of the economy began to swing back. It would not be until after the election that the numbers would come in to prove this. Such is not the case with Barack Obama. Our economic numbers are a reflection of recently past activity. Think about how a business works. At the end of the month, you do your reports and you look at last month’s numbers to determine how things are going. Well, tomorrow’s “last month’s numbers” are happening today, and it’s not pretty. We continue to bleed jobs by the hundreds of thousands. Our economy is in such dire straights right now that more and more people are being added to the welfare and food stamp rolls every day. My job is lost at the end of July. Don’t tell me that things are getting better, Mr. Obama. And it’s not just my job, personally. It’s my position as well as others. My employer eliminated 7 positions. We are not being fired so they can replace us. We are being let go because the company is sucking for air in an economy where there isn’t much money in the system. Everyone is cutting back. Even the rich are cutting back. I go to Lake Gaston once a month and there is nothing even closely remote to the activity I remember seeing there years ago. We once wandered through the desert leaderless. We are now in a dark forest grasping to the hope that if we can just find the one who carries liberty’s lamp, that they can lead us out to the shining city. But, even then, if we take control of the city, the city is run down and it needs a lot of work to make it shine again. Some say we are still leaderless. We are because we think we are. We are because people in our movement have not had the guts and the wherewithal to stand up for the one person who electrified a nearly dead Republican Party nearly three years ago. There are those who walk amongst us in this dark forest who bought into the media lies and the caricaturing of a great woman who put it all on the line for us. She inspired us enough to believe against all odds that we could take our country back. Rather than lie down and die after 2008, many of us joined the Tea Party and united in the idea that we could fight city hall and win. 2010 is proof of that. We need to finish the job in 2012. Sarah Palin could have left liberty’s lamp on the ground and walked off to her own personal castle after cashing in on the fame (and notoriety) of being the first female Republican vice presidential candidate; she didn’t. She could have given us the Italian salute and raked in the royalties from Going Rogue before hitting the rubber chicken circuit to collect her speaking fees. She didn’t. She didn’t have to become a political activist on Facebook and Twitter. She didn’t have to raise money and help the Tea Party win elections in 2010. 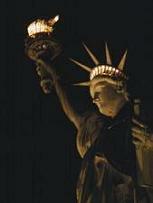 Instead, she carries liberty’s lamp. She is the beacon of light that many on our side refuse to see. Like those who followed the other group to the wrong side of the ship in the Poseidon Adventure, there are Republicans who don’t want to believe that Sarah Palin is the answer and the way to victory. If America reelects Barack Obama in 2012 with unemployment like it is, gas prices through the roof, the housing market in the tank and the debt at near crushing limits, we will know we have reached our Nero moment. We will know that we have put our better days behind us and that the future is nothing more than fending for ourselves as we watch our country become third world. If the Republican Party lets this happen, they’re gone the way of the Whigs. Some will think it’s too risky to run Sarah Palin. But like I said, if America reelects Barack Obama in 2012, it’s already over. We will never know how great we can be again if that happens. We will never find our way back to that shining city on a hill if we choose business as usual over true risk and reward. This is not about safe choices. Our country is going to hell in a hand basket. Countries, like people, when on the brink of death don’t sit there and think about it pondering the what ifs. They know they need to act quickly. This doesn't mean choosing Sarah Palin has to be a reflexive response. Choosing her is not a blind risk, it's a calculated risk. She's been vetted. All the other Republican candidates are fresh meat. Their garbage cans have not been sifted through nor have all their skeletons come out. Those who think the media won't do to them what they did to Palin are mistaken. With Palin, we know what we're getting. Mary Beth House makes this point perfectly in An Open Letter to Sarah Palin. You are perhaps the most vetted candidate we’ve seen in who knows how long. Any potential skeletons have long ago seen the light of day and have lost their sting. You’ve been attacked endlessly from every angle on a range of issues covering the absurd to some of the vilest, most irresponsible insinuations. And yet, you’re still standing. As an analogy, you’re like a toy who’s been played with by energetic toddlers but are no worse for wear. So why would we want to latch on to a new, shiny toy who has not been through the gauntlet you’ve endured? Who could very well break the first time its picked up? Take all of the factions in the Republican Party and get them dead set behind Sarah Palin and we will win. If elected, she will do the hard work required to renew and restore America (and we will be excited again the way were under Reagan). Choose someone else, and if that person beats Obama, great. But that won’t be a win. It will just be preventing a loss which will return us to business as usual. With Obama gone, the complacency will set back in. We can’t go back to business as usual. It’s how we ended up here in the first place.